My Mojo came back for a visit this week and the paper and paints came out ot play . My post today is an A4 sized distressed, rusted effect creation. I had tried to make the rust effect some time ago, but I had lost the 'touch' and I needed to get practising! This piece started out with a rough cover of structure paste on a 220gsm piece of paper to create a tectured surface, which when completely dry, I washed over with an orange coloured paint. I followed that with stencil from Plaid 'Folkart'' to buld up a nice design and more texture. This was then treated with a wash of green paint, wiped over to allow the orange to show through. 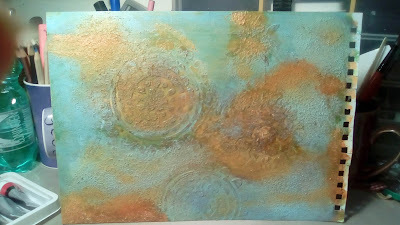 I then build up the layers with blue, brown and orange paint mixing in some medium grain gel to create the crumbly rusting. I do like the finisned result! Now on to the next project while my Mojo is in town. Thanks for stoping by to visit and don't forget to leave me a comment. I love to hear from you.